Today's Bloggers Challenge is Christmas Themed, but use non-traditional colors.....I've never actually seen purple snowflakes - so I think my card meets this weeks challenge...In keeping with my TJ Blogstravganza postings, I've used the Grid Technique, kinda reminds me of looking out a window at the falling snow...After stamping and scoring my card stock, I added Tiera Stickles to the snowflakes for a little sparkle. The sentiment panel is popped up on dimensionals, and also blinged. If you'd like to play along with this weeks challenge, just leave a link to your creation here, or if uploading to SCS, use keyword BC78. LOVE these colors! I especially love all of the bling that you added that gives it that little extra sparkle! Merry Christmas! Purple is one of my most favorite winter colors - but I used it too on my card. LOL This is beautiful Lisa! Love the scored bg too! TFS! This is beautiful, Lisa. You always do such a great job with this technique too! I LOVE your purple snowflakes...lol. What a great way to use these non-traditional colors. 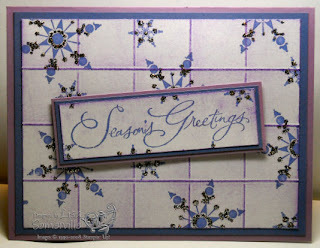 Very Pretty Lisa, I love the purple snowflakes and your grid technique is wonderful. (I'm tired though of looking out the window at falling snowflakes)LOL! Love the purple and especially love the bling! I LOVE the purple snowflakes. This is a very pretty card. Happy holidays. What a pretty color combination! I really like how the grid technique mimics the look of a window--perfect for snow images. The purples are very pretty-especially with this snowflake! You are right! I looks like you're looking thru a window at the snow. Great job...love the purple snowflakes! This is beautiful. I love purple on Christmas cards, I use it on at least one or two every year. Fabulous job.